Katrina Calihan is the Founder and President of Point of Arrival, a full-service leadership and positive psychology coaching, training and consulting firm. She is passionate about partnering with clients to expand their leadership capacities and capabilities, while empowering them with the tools to thrive at work and in life. A key area of interest for Katrina is professional calling – helping clients find it, cultivate more of it, and eventually live each day with passion for their work. 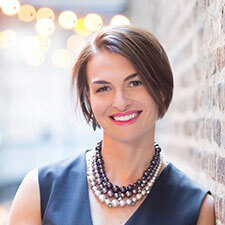 Prior to founding Point of Arrival, Katrina was an established human capital leader, most recently leading HR operations and leadership development for the Chicago office of Bain & Co.
Katrina holds a Master of Applied Positive Psychology from the University of Pennsylvania, a Certificate in Leadership Coaching from Georgetown University, and a Bachelor of Business from Gonzaga University. Additionally, Katrina is a certified yoga instructor with over 10 years of experience in mindfulness practices and teaching hatha and vinyasa yoga.